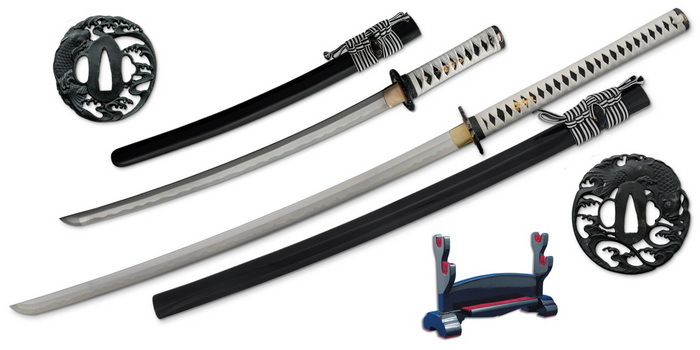 The Koi Katana and Wakizashi ($1,290 & $895) from Paul Chen have hand-forged T10 high-carbon steel blades. The blade on these are differentially hardened using the traditional claying method. These fine peices are mounted in black and white and features black same, the tsuka-ito is made of premium white Japanese cotton. The saya is finished in a deep black lacquer with a black and white striped cotton sageo. A finely rendered Koi, with true front-and-back detail, forms the black iron tsuba. The fittings are superbly antiqued adding to the aesthetics of the piece. The Koi Katana and Wakizashi from Hanwei are each is supplied with a protective cloth bag and traditional maintenance kit. A Black Lacquered Double Sword Display Stand ($170) for the set is included.